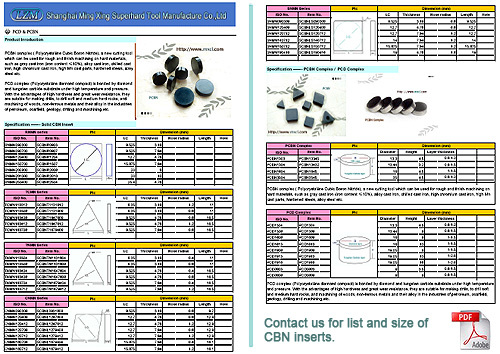 PCBN complex ( Polycrystalline Cubic Boron Nitride), a new cutting tool which can be used for rough and finish machining on hard materials, such as gray cast iron (iron content ≤10%), alloy cast iron, chilled cast iron, high chromium cast iron, high Mn cast parts, hardened steels, alloy steel etc. PCD complex (Polycrystalline diamond compact) is bonded by diamond and tungsten carbide substrate under high temperature and pressure. With the advantages of high hardness and great wear resistance, they are sutable for making drills, to drill soft and medium hard rocks, and machining of woods, non-ferrous metals and their alloy in the industries of petroleum, coalfield, geology, drilling and machining,etc.